Dog bone treats are truly all natural dog treats. The dog treat recipe we give you is very simple and quick. If you are looking for cheap dog treats to make, this dog treat qualifies. No preparation is required for this recipe! Simply go to your favorite grocery store and buy a package! Marrow bones, or soup bones, are sold in the beef section of the supermarket. If not, ask your grocer. These bones make excellent beef dog treats. All you have to do is grill them for a short period of time so that they are not raw. You can even use a toaster oven. 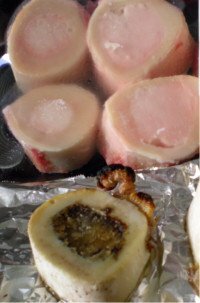 There is a piece of meat in the middle that will easily pop out after grilling. Not only is this a treat for dogs, but then they are left with the empty bone casing to lick. It is similar to one of those dog toys where you put a treat or peanut butter inside. My dogs carry them around and chew on the bone. It is a hard bone and is difficult to splinter. They like to carry them around to tease each other after they have licked off all the beef remnants. The bones at the top of the photo are raw. The one in the foreground was broiled for 15 - 20 minutes in a small toaster oven. Or, turn them on the side and microwave 1 to 2 minutes. The entire kitchen area smelled of broiled meat which excited the dogs. Of course this is one of their favorite treats. It is an outside treat because the grease drippings from the fat will get all over the floor. Our grocery store sells them in packages of 6. The remaining bones can be frozen until ready for cooking. The dogs know that when that particular package is pulled out from the freezer, they are in for a real dog treat!